Beginning speakers often have poor habits that negatively affect their public speaking performance. One such less desirable habit is utilizing filler words like, um, ah, so, you know, etc. while speaking. In previous posts we explained why one shouldn’t use filler words in great detail. Herein, we’ll explore how to minimized or eliminate these non-words from our communication repertoire with 5 easy exercises. Science has an answer on why we fall into the habit of using filler words. We use these words as a verbal place holder when we are thinking — while communicating. They are a verbal representation of our thinking and an indication to our listener that we are not yet done communicating. They are a signal that what we are saying is getting ahead of what we are thinking. These words are irrelevant transitory words used to give us time to think of the ‘right’ word or phrase we want to say next. There are a variety of ways we can practice to minimize (or optimally eliminate) our use of filler words. To be clear, filler words are not a big deal if they are infrequent in nature. Most listeners will expect a few um’s, and ah’s even in a formal presentation. The issue is only problematic when it becomes a consistent misuse of the nonsense words. For anyone struggling with frequent use of these words the following exercises can help. When we get into a nervous or anxious state of mind we see an increase in the number of filler words. Beginning public speakers will often utter volumes of these non-words which hurts the reception of our message. Instead we should work to change our state of mind while communicating and this will reduce our use of these non-words and improve the efficacy of our message. We can get in a calm, relaxed state of mind with visualization, progressive relaxation, meditation and deep diaphragmatic breathing. These practices should be a part of your speech preparation while practicing your speeches as well as before you give a speech. Practice is a great way to build your confidence and improve your delivery. Additionally, practicing your speech will definitively reduce your use of filler words. When we are prepared for any communications scenario we are more focused and effective in our deliver. Our practice should include the techniques we detailed herein to cement these positive habits in our repertoire of skills. Practice is absolutely critical part of ridding these filler words from our public speaking delivery. A better habit than abuse/overuse of filler words is to allow yourself to pause. Doing so will allow you to think about what you will say next without filling the space with words that don’t serve your communication. Pause, then construct what you are going to say internally before you open your mouth. Many beginning speakers needlessly find pausing a nerve wracking experience. A pause of silence allows us to think of what we’ll say next, stay centered and focused on the accuracy and effectiveness of our communication. When dealing with glossophobia or the fear of public speaking, most beginning speakers have a wide variety of physiological/psychological symptoms. Specifically, in terms of the voice and content, when feeling anxious, we often speak more quickly and see an overabundance of filler words. Speaking at a less hurried pace alongside these other techniques will help minimize your use of these meaningless words. Practice slowing down and you’ll notice the difference. A great way to develop a sense of awareness of filler words is to record yourself. Today we have laptops, tablets and smartphone all of which allow us to record ourselves. With any important speech you should practice and record it at least 3-5 times. After each attempt, review your recording and count how often you used filler words. Note the number of filler words and then run through your speech again with an effort to relax, center yourself, and use pauses or words that serve your communication instead. Remember to slow down and be mindful of your word choice. After some practice you’ll see improvement. Everyone has their own filler word nemesis. 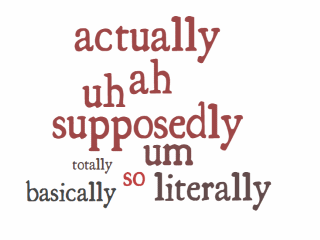 For some it might be a few misplaced ‘um’s’ or ‘ahh’s’ and others it might be a consistent overuse of a tired phrase. As you listen to your recorded sessions (audio or video) take note of what filler words you use and their frequency. Knowing your habits is a first step in a rising self-awareness that will bring freedom from these poor habits. All of these practices should rise in you a sense of awareness of your speaking habits. You will arrive at a place where you are more aware of your ability to choose not litter your speech with these meaningless words. You’ll be more focused and present in your deliver so these words will become a rarity in your speech. Awareness will come in time with practice of these methods. Perfectionism is the enemy of success & personal growth. When we learn to live with a more realistic vision and understanding of ourselves as fallible but eternally capable – success is much easier. We understand a few filler words here and there are not the end of the world. Perfection should be no one’s goal because it doesn’t exist. Realistically, we should aim to minimize (if not eliminate) these filler words from our communications repertoire. We often tend to be our own worst enemy when it comes to overcoming personal obstacles like filler word. Use a truism of behavior modification to help shape your use of filler words for the better. Put in place a reward that you’ll give yourself when you deliver a speech with a dramatic reduction (or even elimination) of filler words. Do something nice for yourself, go see that favorite band, buy that favorite shirt or even just take some ‘me’ time. Simply come up with a way you will reward yourself for your efforts and you’ll see results. The use of filler words is a pervasive bad habit. Why not instead start to create a positive habit that serves your success as a speaker? Starting a new habit is never easy but with these many options I’ve included in this post you’ll have a myriad of ways to begin. Start today to create the new habit you’d like to define your speaking and leadership capacities that will define your bright future. You shape your own habits, choose them with intention. Practice them and discard those that don’t serve you. Um, O.K.‽ Does this, like make sense? 😜 I hope you’ll explore these methods to minimize your use of this imprecise language. But remember, it’s not perfection we seek on any learning journey but progress. Let us know how it goes in your comments below. Comments or questions, feel free to leave them below or contact us. 3 Responses to "10 Ways to Eliminate Filler Words"
I have trouble with this in my speeches. I use the word “um” a lot has caused a large part of my audience to notice and it seems to tune out. I am going to use your tips here and apply them to my work. Thank you so much for sharing this. I nearly bought a book on this and you answered all my questions already. Filler words are something I didn’t have that big of an issue with over-coming but my problem is that I replaced it with something else. Instead of using filler words, I would go all dead air. Having looked back at a presentation that was recorded I gave last year, it really showcased so many of my weaknesses when trying to keep a room’s attention.